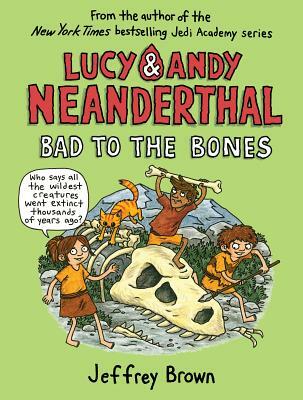 From the author of the New York Times bestselling Jedi Academy books comes book three in the laugh-out-loud graphic novel series about Neanderthal siblings Lucy and Andy. Fans of Big Nate, Diary of a Wimpy Kid, and the Terrible Two won't want to miss it! Lucy and Andy have some extra space in the cave now the humans have moved out. But they do miss hanging with Sasha and Tommy. Luckily, their new friends live right around the ice block, close enough to form an explorers' club! These adventurers are on the hunt. Their first big discovery: dinosaur bones! Jeffrey Brown masterfully blends facts with funny in this graphic novel series. Includes theories about how Neanderthals went extinct; a timeline covering the history of Earth, dinosaurs, Neanderthals, and present day; museums, caves, and paleontologists of note; and Neanderthal Fact vs. Fiction. Jeffrey Brown is the author/illustrator of the bestselling Star Wars: Jedi Academy series and the Darth Vader series. He resides in Chicago with his wife and two sons. You can visit him at jeffreybrowncomics.com.